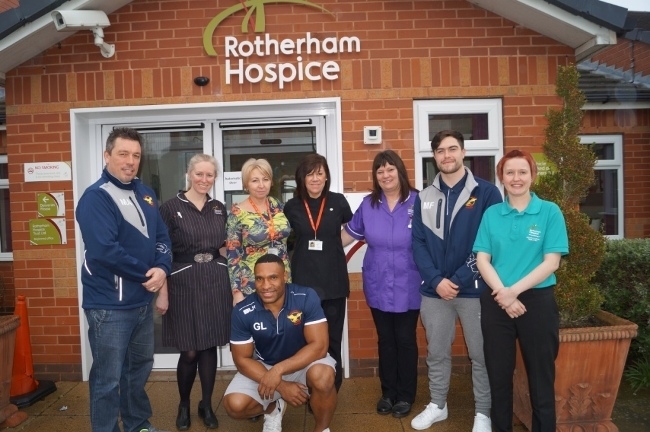 Sheffield Eagles players swooped into Rotherham Hospice to bring cheer to patients and staff. The rugby league giants have named the hospice their 2016 charity of the year – and are already proudly displaying its logo on their playing kit. A chunk of the proceeds from their April 29 game against Dewsbury Rams will wing its way to the hospice, which needs over £5 million a year to deliver specialist care to those with terminal illness. A percentage from tickets sold by the hospice, plus corporate sales on the day, will be donated and hospice fundraisers will be staging bucket collections at the match. The charity name is also on all replica kits currently on sale to supporters. Eagles chief executive John Whaling, who is also a hospice trustee, is delighted with the club’s charity choice for 2016: “It is an amazing place. I am personally fully aware of the great work it does because my father-in-law was nursed there,” he commented. The Broom Road hospice, which celebrates its 20th anniversary in September, has a 14-bed inpatient unit, provides 75 day places every week and a community team which provides care to people in their own homes. Said hospice chief executive Christopher Duff: “We need over £5 million annually to deliver these services and rely heavily upon local people and organisations for their support. The April 29 game at Sheffield Hallam University Sports Park kicks off at 7.45pm.